As my plane approached the Yangon (Rangoon) airport I began to get nervous about the level of surveillance and control I would be facing in the coming ten days. Would they search the files on my computer? Would they confiscate the dozen bagels I was bringing in as a gift? And most of all, how would they react when this supposed “tourist” was picked up by an official U.S. Embassy van? Fortunately, those specific fears were baseless; my entry into the country couldn’t have gone more smoothly. My passport and visa were examined, I picked up my luggage without a cursory look, and — before I could acknowledge that after over 30 hours of travel I had actually made it all the way across the world — I was whisked into the arms of Wesley Hughes, the Embassy’s Cultural Affairs Specialist. From Wesley’s name, I had expected to find a typical foreign services type, a WASP Yale graduate or the like. To the contrary, he was a jolly Burmese gentleman (with a fascinating family history, which I hope to get into in a future post). The Embassy van, however, was exactly what you’d have predicted: a Chevy SUV (with the ironic nickname “Rolling Thunder”), probably the only such car in the entire country. (Someone told me later that it cost upwards of $100,000 to import a Western car into Burma — all of which money went directly to the military government). The rest of the cars on the road were mostly a sad collection of clunkers patched together from spare parts. It was a quick drive to the Embassy, and in my bleary state I barely had time to take note of my surroundings — other than that Yangon seemed quite similar in feel to other Southeast Asian metropolises like Bangkok, Kuala Lumpur, and Jakarta: chaotic, dusty, and polluted (though no motorbikes — which I’ll also get into later). I also saw no gratuitous examples of a military presence. It wasn’t like there were armed soldiers or police on every street corner. Security was quite extensive at the Embassy, however. The van had to pass through a double-gate and undergo a complete inspection: checking the doors, the hood, and including the use of what was apparently a giant mouth mirror to peer under the van for — what? — bombs? Once inside the Embassy grounds, I surrendered my passport to a crisply appointed Marine guard behind bulletproof glass. Only then was I officially inside. Wesley then left me in the hands of his superior Blake (the guy I’d had the less-than-secure phone call with some days before), who was more the type I expected: tall, handsome, and friendly in an all-American way. I gave Blake the bagels, then it was off to meet Larry Dinger, the Chargé D’affaires. Dinger is ambassador in all but name, the U.S. having withdrawn our ambassador some years earlier in protest of the Myanmar government’s undemocratic ways. In fact, Dinger has previously been U.S. ambassador to the Republic of the Fiji Islands, the Republic of Kiribati, the Republic of Nauru, the Kingdom of Tonga, Tuvalu, and the Federated States of Micronesia! (So I suppose this posting was taking Dinger outside of his comfort zone of the South Pacific…) The meeting was perfunctory, though he had a copy of A.D., and I felt quite honored to be given the time, reminded that I really was in the country in an “official” capacity. Then it was off to my security briefing. Joe the security officer was a hairy fellow and, if you ask me, a bit of tool. He told me that as an American the “number one rule” was “city buses are forbidden,” meaning I wasn’t allowed to take one. Joe explained that every six months or so “some group” set off a bomb on a bus, usually leaving “zero or one casualties. But let’s not have that casualty be you. Just take a taxi.” OK, sir. Joe seemed to be starring in his own spy movie. And even though my bagels had made it through customs, my paranoia was starting to come back. P.S. Again, some names have been changed to protect them from whomever might be reading this for the "wrong" reasons. Blake Dreiser, the Assistant Public Affairs Officer for the U.S. State Dept. in Myanmar, was calling me late on a Tuesday evening (Wednesday morning, Myanmar time). His first words were to warn me that anything we were talking about might be monitored. “Let’s keep details vague,” he said. Having accepted the State Dept. offer to visit Myanmar on an official mission, I was busy getting ready for the big trip. I was researching the country, preparing for the long flight(s), buying appropriate clothes, and thinking about how I might structure the workshops while I was there. But we had hit a snag. My visa was the issue. The State Dept. had initially tried to get me a business visa under their auspices, but the application had lingered on a desk at the Myanmar embassy in Washington, D.C. (The U.S. and Myanmar having strained relations, Myanmar figured there was no great incentive for them to approve official American visa requests.) Panicking a bit, the State Dept. had retrieved the application and my passport, and asked me to apply for the visa, as a “tourist,” here in New York, at the Burmese consulate. I was worried about what exactly this meant. I knew that Myanmar was an Orwellian country with extreme censorship, no political parties (let alone free elections), and a secret police that spied on its populace. Wouldn’t the Burmese consulate know that I had already applied and essentially been rejected? And couldn’t I get in trouble if I showed up in Myanmar with a tourist visa under false pretenses, and then immediately took part in an official week-long program sponsored by the U.S. State Dept.? I had a lot of questions for Blake. Despite the apparent risks, I threw myself into the game. After all, I had read my share of John LeCarré and Tom Clancy novels. I was ready to discuss the situation obliquely, maybe even refer to my situation as that of “a friend.” And from what I guessed, whoever was monitoring the call probably knew that it was coming from the U.S. embassy but not the extension Blake was calling from. And the same thing with my identity. Blake had called me “Josh,” but not my full name. And even if they knew the number he was calling, it would be a bit of work to figure out who exactly I was. Blake quickly dismissed my concerns about the visa situation. He took a fatalistic tone, saying he didn’t think the Burmese embassy in D.C. and their consulate in New York were coordinated enough to catch the fact that I was re-applying. And he figured that once I made it into the country, the secret police wouldn’t put many resources into tracking me. Easy for him to say! But all the same, he did a good job of easing my fears. But then Blake began systematically blowing whatever “cover” we had established. “Listen” he said. “If you have any trouble, or need anything, give me a call.” And then he proceeded to give me his office number — down to the direct extension — and his personal cell phone number! To top it off, he dictated me his personal email address, blake.dreiser@gmail.com. So now whoever was listening in knew exactly who was calling. But he wasn’t through. As we got ready to sign off, Blake blurted out, “Oh, hey, Josh. I meant to tell you, I really enjoyed your book, A.D.: New Orleans After the Deluge!” Great. Thanks, Blake. Now they knew me as well. Blake Dreiser: Worst. Spy. Ever. P.S. Names have been changed to protect people’s identities. I was reading a review of the new CHiPs DVD in The Times the other day and came across this observation, “In nearly every episode of the first season of ‘CHiPs’ a Volkswagen Beetle the color of a blood orange putters somewhere in the background, riding down the highway or parked at an illicit auto chop shop.” Suddenly, I had this flashback to fifth grade in San Diego. 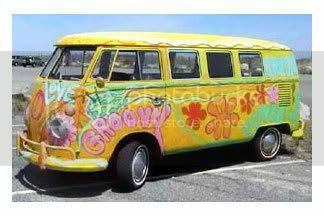 All during that year I kept seeing the same “flower power” VW bus (similar model to the right), whether it was driving by when I came out of school, or going the other way on the highway, or parked nearby when I went out to dinner with my mom. I just couldn’t shake it. Growing up as pretty much the only Jewish kid I knew in SoCal, and never having watched any Woody Allen movies, I still had a finally developed sense of paranoia: I was sure that bus was following me! Maybe it was residual guilt I felt from my minor shoplifting career at Safeway (comic book digests, the ocassional Hotwheels car or toy motorcycle, and candy), but I definitely thought the brightly colored hippie bus was after me. It didn’t help that I never saw the driver, or that my friends or my mom didn’t take my fears seriously. But I was never really scared of the bus. I mean, what could someone driving a car as goofy as that do to a little kid? I think I just liked the idea that someone out there thought I was important enough to keep me under surveilance. And when I moved to San Francisco the next year, I never saw that bus again. But what was the deal with that red VW Bug from CHiPs?